SKK Mobile V2 is now officially announced with 5-inch display and quad-core processor. Out of the box, this phone will be powered by Android 4.4 KitKat. It's also interesting to note that the device sports an iPhone 5s-ish design philosophy with its circular-accented home button. The idea also denotes that the SKK Mobile V2 is the successor of the Marian V1 released earlier this year. Price has not been unveiled as of this writing but basing on the given specs, it'll hit the midrange category. 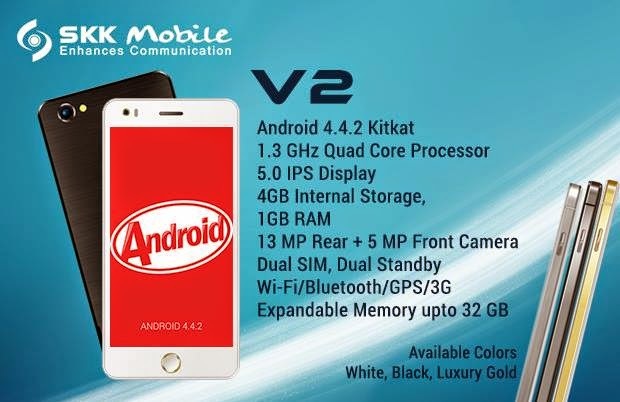 The SKK Mobile V2 will pack a gigabyte of RAM and 13-megapixel camera among any other capable features. Check out the rest of the specs below.